Fresh peach pie–with flaky crust, bubbling with golden goodness and dripping with sweet syrup? Is there anything better? Well, maybe if you consider adding coconut ice cream. But, what if you can’t eat sugar, or gluten in regular crust? No worries, my friends, I have the perfect peach pie. 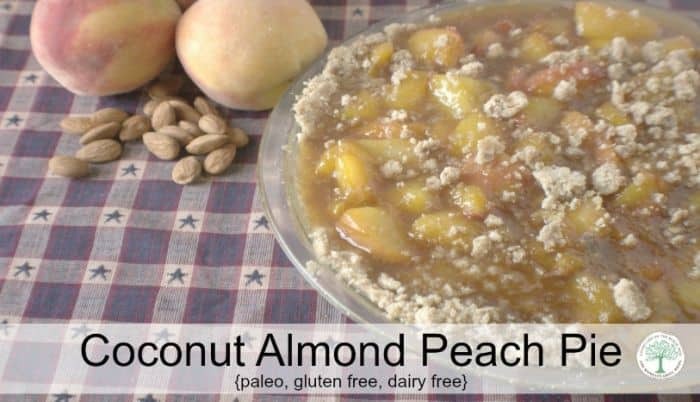 It’s paleo, gluten, and dairy free and ready in less than 30 minutes to be enjoyed! Are you ready for peach pie tonight? What would you put on top–coconut ice cream, coconut whipped cream, or both? Be sure to pin this for later! Sift together the coconut flour and almond meal. Add in the sugar and mix together. Stir in the almond butter. Pour the coconut milk in, 1/4 cup at a time, stirring well after each addition. You may not need the full cup of milk. The crust should be able to hold together when you press on it, but not overly wet or sticky. Place the mixture in a greased pie plate and press down with your fingers to put into place. Carefully remove the pit from the peaches and chop into pieces. In a medium sized pot, add the coconut oil and turn on medium high heat. When the oil is hot, add the chopped peaches, and cover with the honey. Next, add the lemon juice and cinnamon. Simmer on medium heat until the peaches are nice and tender, stirring frequently. 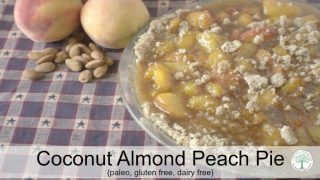 Sprinkle the arrowroot powder over the peach mixture and allow to simmer for 5 minutes to thicken. As it is thickening up, stir constantly. 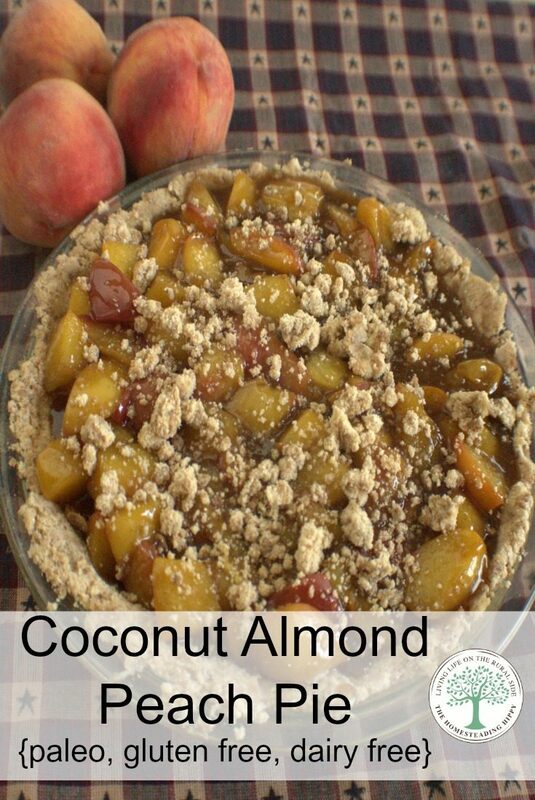 Pour the hot peach pie filling into the prepared crust and allow to cool for 15 minutes before serving.